This blog is a companion to the interview with Barbara Marx Hubbard and Dr. Marc Gafni on VoiceAmerica âInnovative Leaders Driving Thriving Organizationsâ on March 21, 2017 focusing on navigating a smear campaign they experienced, respectively, as the board co-chair and the founder of the Center of Integral Wisdom. What emerged was a much more hopeful conversation. They are modeling the behaviors they teach as they confront this challenge, and are working to leverage what would for others be a crippling crisis and share the culture of collaboration and unique contribution to a conscious world. They are talking about an evolution of our culture! So here are the bios for our guests. They are both well positioned to talk about creating a positive future given their professional and life experiences. 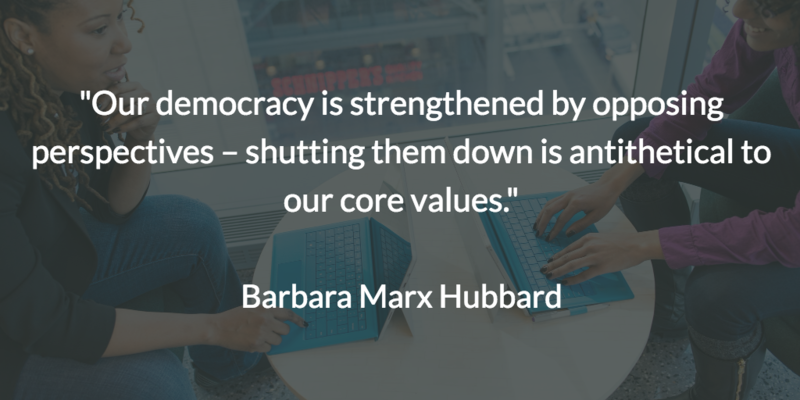 As a prolific author and educator, Barbara Marx Hubbard has written seven books on social and planetary evolution. She has produced, hosted, and contributed to countless documentaries seen by millions of people around the world. Barbara Marx Hubbard is not an idealist, nor does she believe that social and planetary change is simple, but she does believe that humanity has the tools, fortitude, and resolve to take the leap toward conscious evolution. One of her best known quotes, âEvolution by choice, not chance,â says it all when speaking with this visionary leader. Dr. Marc Gafni is a visionary thinker, social activist, passionate philosopher, and author of ten books, including the award-winning Your Unique Self: The Radical Path to Personal Enlightenment. He holds his doctorate in philosophy from Oxford University. He has been a guest editor of the Journal of Integral Theory and Practice on issues of integral spirituality, and a faculty member of JFK University. He is the co-founder, together with a stellar group of thought leaders and social innovators, of The Center for Integral Wisdom, a leading activist think tank dedicated to articulating a practical politics of love, and to catalyzing an emergent personal and global vision of ethics, Eros, and meaning. Barbara Marx Hubbard serves as co-chair of the Center. We, as a society, use the word love differently and, often, far too flippantly. My belief is that the best antidote to the pain, fear, and hurt many people on our planet are facing is the action inspired by hope and love. To many people, âhopeâ and âloveâ may sound like âsoftâ words until you are called to put them into action. There is nothing âsoftâ about standing by a principle you value at the risk of your livelihood. Yet, for many of us, this is exactly what we need to do to live in a just society. Our military members take a stand for a free country and they defend it with their lives. They defend principles. Each of us is called, as well, to stand by our principles. This interview seems risky to me. There are people who targeted my publisher because they also published Marcâs books. For me, publishing this blog and this interview reflects taking a stand in supporting a colleague when he has been wrongly accused. For Barbara, it means risking losing several speaking engagements because of her association with Marc and the Center. At one point, her daughter was contacted as part of the smear campaign. As we look at this evolution taking place on our planet right now, many of us will feel called to take action. Yet it is hard to know where to start when the needs are so great and our lives are so busy. Nevertheless, in the face of outrageous pain, we must demonstrate outrageous love. 1. Identify where and how you can uniquely contribute to the world you want to live in. Identify your vision and values. What will you focus more energy on or start doing? What behaviors do you amplify, and which change based on your values? 2. Identify what you want to stop doing so that the âold way of doing thingsâ slowly withers to make space for a world that is more peaceful. 3. Identify who you invest your energy in and who do you want to spend less time with? 4. Identify how you can make these changes in your organizations. How are you creating businesses that thrive and evolve to create the next evolution of the world? If you are leading an organization, are you looking toward innovation in your products, your mindset, and your behavior? Remember that most of life is a package deal. We each have unique skills and abilities, as well as life situations. We are each called to make changes in different ways. I invite everyone reading this to consider how you can invest your time in the positive changes you want to see in the world, as planting a positive seed can flourish and grow around the world as others contribute to the changes we have started. Others will continue to nurture it so that we can all help one another and soon we will have a forest of change. Maureen Metcalf, CEO and Founder of Metcalf & Associates, is a renowned executive advisor, author, speaker, and coach whose 30 years of business experience provides high-impact, practical solutions that support her clientsâ leadership development and organizational transformations. Maureen is recognized as an innovative, principled thought leader who combines intellectual rigor and discipline with an ability to translate theory into practice. Her operational skills are coupled with a strategic ability to analyze, develop, and implement successful strategies for profitability, growth, and sustainability.